The second part of this article discusses Water Clocks. The first part of the article discusses Sundials. 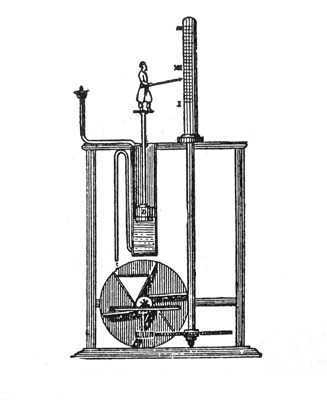 The water clock, or klepsydra, probably developed in response to the shortcomings of the sundial, namely the inability of the sundial to work when there was no sun and to maintain a constant division of time. The later, though, was only an issue when a timer was needed rather than a clock. The klepsydra could perform either function. The first and simplest water clocks were small bowls. In the centre of the bowl was a small opening through which water could flow. The empty bowl was placed in a basin of water and allowed to sink as water leaked into the bowl through the opening. The clock's attendant would announce that the interval of time had passed and reset the bowl to sink again. This process was easily inverted so that water flowed out of small tanks rather than into them. The openings could be plugged to stop the water from flowing out. The immediate use of this kind of clock was the timing of speeches in law courts, most notably in Athens. Several Athenian sources indicate that this kind of judicial water clock was in common usage around 430 B.C. including Aristotle, Aristophanes the playwright, and Demosthenes the orator. This water clock was used as a timer to prevent trials and speeches from going too long. The type of speech or trial determined how much water with which the clock was filled. First he created an aperture, made of gold or a perforated gem, because these are not worn down by the impact of water, and not being susceptible to corrosion they will not plug up. Now water, flowing evenly through this aperture, raises an inverted bowl, which is called phellos or tympanum (drum) by clockmakers. A bar is affixed to this float, with teeth on its other end that engage with similar teeth on a revolving drum. These little teeth, one propelling the next, create small rotations and movements. At the same time other bars and other drums, toothed in the same fashion, compelled by one motion, produce various effects with their rotations: statues move, goalposts are turned over, stones or eggs are thrown, trumpets blare out, and all the other amusements. Several problems arose with this device. The first problem was that a constant pressure of water was needed to keep the flow of water at a constant rate. The second was that the water clocks needed to match the sundials. In other words, the water clocks could not have a constant hour every day of the year, but needed constant adjustment so that there were always twelve hours per day and twelve per night. The solution to the first problem was to have the klepsydra supplied from a large reservoir of water kept at a constant level. A continuous flow of water into the reservoir was needed. This flow was greater than the loss of water at the bottom of the reservoir that fed the clock. An overflow pipe was supplied near the top of the reservoir to fix the height of the water. Thus constant water pressure was maintained. In the Roman Agora of Athens, much still survives of a large stone klepsydra known as the Tower of the Winds. One can still see where the reservoir of this clock received its water from the aptly named Klepsydra Spring. Examination shows that its overflow pipe was used to feed the several fountains that decorated the tower. Among these [various amusements] the hours are marked out on a column or pilaster -- a figurine, starting from the bottom, indicates them in turn with a wand all throughout the day. The shortening and lengthening of the days must be corrected day by day and month by month through the addition or removal of wedges. 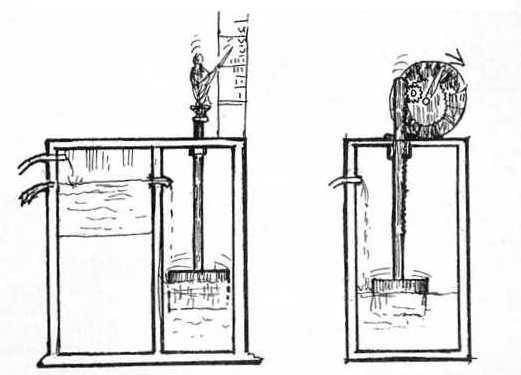 The stopcocks for the water should be made in the following way so that they can be regulated: make two cones: one solid, one hollow, finished on the lathe so that one of them can enter and fit inside the other, and their separation or telescoping on the same bar should make it so that there is either a forceful or a gentle flow of water into the tank. Thus, by these principles and this device, the outfitting of a clock for use in winter can be assembled using water. The hollow cone of which Vitruvius speaks was the opening at the bottom of the reservoir tank through which the water flowed into the clock. The solid cone was connected via a chain to a crossbar at the top of the reservoir above the water line. By inserting wedges between this crossbar and its supports, the chain and cone could be raised or lowered to allow more or less water to flow out of the reservoir. More water would need to be let out in the winter months, causing the clock to fill more rapidly to account for the shorter days. In the summer, less water was needed so that the clock filled more slowly. The opposite arrangement would be needed at night. The size of the wedges and what days, weeks, or months they corresponded to (depending on the desired accuracy) would need to be calibrated with a sundial or a half year of observation. Other devices were employed to vary the hour lengths by regulating the flow of water from the reservoir. One particular mechanism was a disk with 365 holes of varying sizes. The hole corresponding to the date of the winter solstice would be the largest, that of the summer solstice, the smallest. These two were at opposite ends of the disk with the other holes arranged between them in increasing or decreasing sizes. The water from the reservoir would flow through one of these holes on the corresponding day of the year. At the end of each day, the disk would be rotated by one hole. Thus the clock would fill at the correct rate each day of the year. Again, this method would need to be calibrated by a sundial or careful observation. Altering the clock "face" and letting the water flow remain constant throughout the year could also address the problem of varying seasonal hours. Such a water clock dates back to the third century B.C. and was also attributed to Ctesibius. The constant flow of water into the clock would, by means of a float, slowly raise an indicator, a small figurine with a stick for example. The stick would point to the time as displayed on a column. The hour markings around the column would reflect the shortening and lengthening of the hours throughout the year. The column could then be rotated periodically keeping the clock accurate. With a little ingenuity, the water from the clock could be used to rotate the column daily. 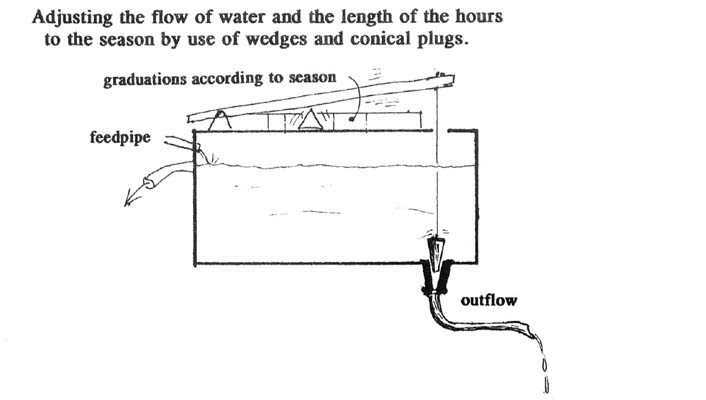 Using a small tube as a siphon, when the clock is completely filled with water at the end of the day, the water empties through the tube and falls onto a small waterwheel. Through a system of toothed gears, the turning of the waterwheel would rotate the column marked with the hours. The first part of the article discusses Sundials.